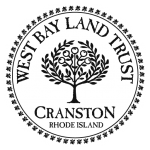 Thank you for considering a donation to, or becoming a member of, The West Bay Land Trust. We’d love to have you join in our activities, but if you can’t and still wish to help us, we’d appreciate your contribution to our efforts. We are a 501(c)(3) non-profit corporation and survive with the help of some very dedicated volunteers, but we do need to meet necessary expenses too. We are always on the lookout for conservation opportunities and if you are interested in working with us to save future farms and agricultural areas in Cranston from commercial development, please contact us. Our annual membership dues are $25.00 for a single or family membership. We will send you a confirmation for tax purposes. 2) Download a form (PDF) to print out and mail to us. Thank you for your consideration. We can do more because of you.